These Miniature Converters are no Bigger than a DB-25 (or DB-9) Backshell! 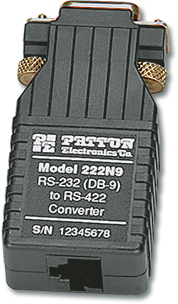 The Patton Model 222N Series of converters now comes in two "flavors": The Model 222N allows an RS-232 device with DB-25 port to connect to an RS-422 device up to 4000 feet away over two twisted pair. The Model 222N9 does the same thing for an RS-232 device with a DB-9 port (now called EIA-574). Both converters support data rates up to 19.2 kbps, and require no AC power or batteries for operation. All handshaking lines are looped back. The Model 222NRC is a dual rack card version of the Model 222N, with two converters in one card! Note: Model # 222N9FT (shown above) comes with thumbscrews. Other 222N models come with slotted captive fasteners.